Not to be outdone by the Athletics' bold move this morning, the Detroit Tigers made a little noise of their own close to the trade deadline this afternoon by piecing together a blockbuster three-team trade to acquire David Price from Tampa Bay. Said deal includes the Tigers sending centerfielder Austin Jackson to Seattle, lefty Drew Smyly and shortstop prospect Willy Adames to Tampa, who will also receive infielder Nick Franklin from the M's. The Fox Sports team of Ken Rosenthal and Jon Morosi broke the story. Let's break it down. Does this Price deal happen if the Jon Lester trade does not happen? It's not crazy to suggest that it would not have, even as Tampa and Detroit began discussing such a move about a week ago. If anything, the Lester move helped grease the engine even more to get a deal done in my opinion and it is easy to see why. Price is certainly one of the finest pitchers in all of baseball and is a legitimate ace. He has had a very good season for him and has been absolutely brilliant the last two months after starting out slowly with an inconsistent April. He leads the league in strikeouts and has the best FIP (2.93) and xFIP (2.73) of his career. He will only bolster an already strong Detroit rotation. In fact that rotation is so good now that you could make a legitimate case that Justin Verlander, who has really struggled in 2014 thus far, should not get a playoff start in a four-man rotation. Max Scherzer, the reigning AL Cy Young recipient, has been tremendous and Anibal Sanchez and Rick Porcello have not been that far off. Add Price to that mix and look out. 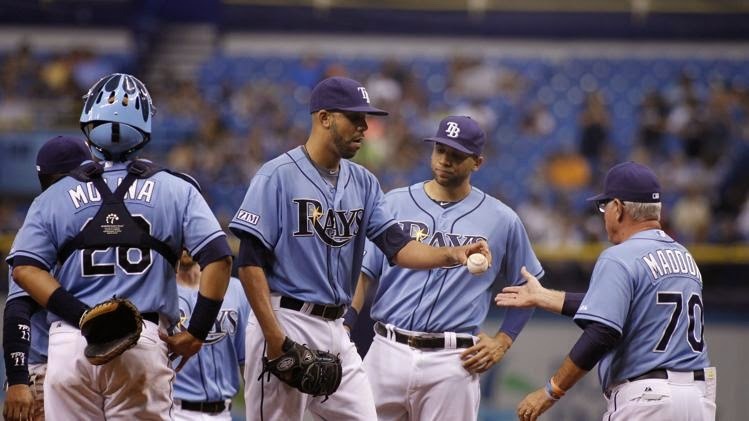 For the Rays, I do understand that they are a small market, low budget team that struggles to draw attendance. That said, the Rays have been one of the best teams in baseball of late and in a mediocre AL East could have found themselves to have been a legitimate contender down the stretch. Now, they have to fight hard to get back in the race in the wake of trading their ace. That's a tough pill for a clubhouse to swallow. That said, they did not get back a terrible haul for what it is worth. Smyly is a fine lefty who will add to what will still be a deep rotation. Franklin was a first round pick only in 2009 and while he has not hit at all, he could project to be a solid replacement for Ben Zobrist down the line. Adames may make this deal for the Rays as the 18-year-old is considering to be a fast riser and who may have been Detroit's best prospect. The Mariners have begun to slide a little bit out of the playoff picture but in Jackson, they got themselves a major improvement over the hideous production they had been getting in center this season. They had soured on Franklin and in turning him into a solid centerfielder, they did themselves well. But there is no question that the winner here is Detroit because just as we had starting to think that Oakland may have made themselves the World Series favorite, now it's a tough discussion to have.